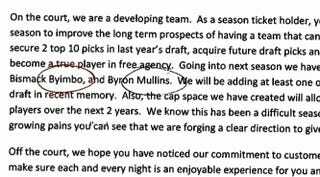 A reader and Bobcats season-ticketholder (we extend our deepest sympathies) passes along this letter from Charlotte management which mentions the exciting things happening in the 3-25 Bobcats' future. The exciting things, as you might have guessed, are not really exciting. On the court, we are a developing team. As a season ticket holder, you are aware that we made a conscious decision this past season to improve the long term prospects of having a team that can truly compete in the Eastern Conference. We were able to secure 2 top 10 picks in last year's draft, acquire future draft picks and give our organization the salary cap flexibility needed to become a true player in free agency. Going into next season we have a core of young players like Gerald Henderson, Kemba Walker, Bismack Byimbo, and Byron Mullins. We presume Bobcats prez Fred Whitfield means to talk about Bismack Biyombo and Byron "B.J." Mullens. He probably hasn't committed their names to memory yet. It's understandable. No one else has either.